Whats it mean to be Heathen? This was published in Mamaskylark 360. I taught it was so well written that I ask to copy this here. With her permission here is her taughts. "Heathens practice the religion known as Asatru (or alternatively Forn Sed, Odinism etc.). 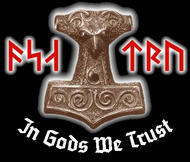 Asatru translates directly as being true/loyal/dedicated to the Aesir. The Aesir (and the Vanir) are the pre-Christian gods of Northern Europe. An Asatruar worships the Aesir, Vanir, ancestors and other spirits. As a youngster, I was very proud of my German heritage, however, in the 6th grade I read Anne Frank and came face to face with this ugly part of history. At this point, I guess you could say that I disowned myself from my ancestral roots. At that age, I did not realize or understand that I could appreciate my ancestry while disavowing the acts of Hitler and the corruption he brought with him. When I began to search for my religious identity, some 15 years ago, the idea of following my heritage was so repressed that I ignored the myths and calling of Northern Europe. I researched and examined various religions including Taoism, Buddhism, Hinduism, Native American practices and Wicca. A number of aspects of each of these appealed to me, but I could not quite identify with any of them. I simply called myself an eclectic pagan and occasionally practiced elemental magick, some divination and observed the cycles of the sun and moon. Upon moving to California 3 years ago, I resolved to once again pick up my quest for religious identity. It was during this period that I was introduced to Asatru. So far I have just given you a really brief insight into how I came to follow my path but I have not yet explained it. You may be asking yourself, “But what is Asatru?” Given its extensive nature, it is impossible to give an accurate presentation in only one sitting. Asatru has been coined “the religion with homework” and this is very true. So I will simply begin to compare and contrast the primary differences between Asatru and Wicca as well as include some personal dialog about how these differences played a part in my identification with Asatru. First off there is one primary similarity between Wicca (used generally to imply eclectics as well as formal initiates) and Asatru. They are both nature/Earth based religions which recognize both Goddesses and Gods. However, that is almost where the similarities end. Heathens see our Gods and Goddesses as being truly individual personalities as opposed to the general Wiccan belief of archetypes. Our gods are seen as fathering us and as such are looked upon as our eldest ancestors. We don’t bow down to them but respect them as one would respect an older family member. In my earlier searching, I had difficulty relating to the gods as archetypes. I believe that this approach may work for others but I never really felt like I could come to “know” a god this way. In some ways, using archetypes was like saying that the God’s full personality really didn’t matter. It was only this or that aspect that held importance. By extension, if we believe that we are reflections of the divine then the sum of who we are as individuals is not important either. I could never relate to this slicing and dicing of character to fit ones needs. Another difference is in the use of magick. Being an Asatruar does not mean that one must practice any sort of magick. Rather our rituals are simple affairs in order to honor our Gods rather than call on them for some intended effect/outcome. Some Asatru do practice magick. I have practiced magick, I continue to practice magick. However, I am far more comfortable practicing magick now within the confines of my religion. I have a fuller grasp of the energies I am working with. Asatru is a folkway. This means that it has a strong moral and ethical code and heathens hold strongly to these. Perhaps, I will discuss these aspects at another time. It always seemed to me that personal responsibility in the Wiccan perspective was limited to the three fold rule of magic. Where is the responsibility of ones actions in our everyday life? Where is the responsibility to provide an example for future generations? Where is the responsibility of one to their history and ancestors? These were important to me but seemingly ignored by Wiccan thought, or at least given less importance than I found necessary. In summary, Asatru serves not only my religious/spiritual needs but also conforms to my instincts, my mindset and my outlook on life. These are the things that make a religion come alive for its practitioner. Hail the Aesir, Hail the Vanir, Hail the Holy Wights! 7. Why Am I A heathen?